Indications: Pain relief, fever reducer and anti-inflammatory. Summary Recommendations: Ibuprofen is generally considered safe for use in the first and second trimester of pregnancy for the relief of mild to moderate pain, fever and inflammation. 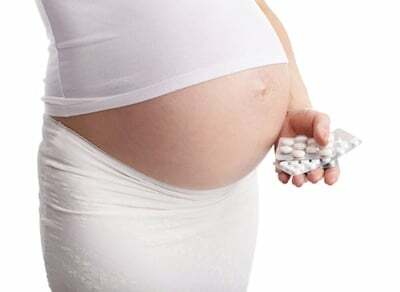 There is concern with intake of ibuprofen and medications containing ibuprofen in the third trimester, so many obstetricians suggest medications considered safe in all trimesters of pregnancy. Common names for ibuprofen include Nuprin, Motrin and Advil. General Precautions: Ibuprofen is an over-the-counter and prescription medication that may not be safe for all pregnant women. The medication is generally considered safe during the first and second trimester of pregnancy, though a few studies have linked ibuprofen intake during the first trimester to gastroschisis. The condition is extremely rare and further study could not replicate the increased risk, so there is some debate about the connection. Studies have also associated ibuprofen intake in early pregnancy to possible increased risk of heart defects, though some experts are skeptical about the association because information about why the ibuprofen was being taken is not known in all cases. There are studies proving birth defects associated with ibuprofen intake in the third trimester of pregnancy. Associated birth defects include increased risk of ductus arteriosus, pulmonary hypertension and olgiohydramnios. Ductus arteriosus is a premature closing of a fetal heart vessel, which can lead to pulmonary hypertension. Olgiohydramnios is reduced amniotic fluid volume. Ibuprofen may also slow or prevent labor. Effect While Trying to Conceive: There is no connection between ibuprofen use and male infertility, but there could be an association with female infertility or difficulty conceiving. Studies have shown a possible connection between unruptured follicle syndrome and ibuprofen use. Unruptured follicle syndrome occurs when the mature egg is not released into the fallopian tube, despite all other processes occurring normally. The syndrome is most often associated with chronic use of ibuprofen. Effects on Pregnancy: The complete safety of ibuprofen use during pregnancy is not clearly established. Some studies have reported an increased risk of miscarriage associated with ibuprofen use so women are cautioned about using ibuprofen if they are trying to conceive. Safe During Breastfeeding: Ibuprofen is considered safe for use by breastfeeding mothers. The medication passes to the infant, but the amount is so small that no effects have been reported.